Fall is a beautiful time of year to visit local gardens to get a new design perspective, planting ideas and, at the North Carolina Botanical Garden in Chapel Hill, seeing how garden art can enhance the landscape and give your garden life beyond nature’s ever changing ways. 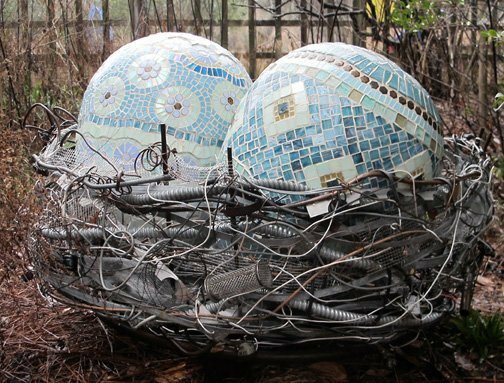 The North Carolina Botanical Garden’s annual Sculpture in the Garden is held September through early December. 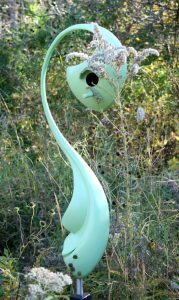 During these days, when you visit the garden to see the splendor of the native wildflowers and shrubs, you will also find one-of-a-kind sculptures artfully placed among the plantings. The North Carolina Botanical Garden is a teaching, researching and public service facility of The University of North Carolina at Chapel Hill. The gardens are well known as a center for the study, display, interpretation and conservation of native plants. Each fall the garden’s display has been enhanced with artwork from artists with ties to North Carolina. The pieces use a wide variety of media, including clay, concrete, granite, marble, mirrors, steel and wood. I’ve attended this show for the past several years and I’m always impressed with the talent on display. The placement of the art in the garden setting enhances the visitor experience and presents ideas of how art can be incorporated in the garden at home. Each step down the garden paths presents a new angle of the art to catch your eye. Stepping further, there is another piece to capture your attention. The setting is ideal for garden art inspiration. It’s also important to me that there are no works of art from a previous exhibit since that is one of the criteria for entry; each piece of art has to be original, not previously exhibited at the North Carolina Botanical Garden. This ensures new works of art each year, keeping the exhibit fresh. The show has never let me down. I hope I see you there. Featured image by Helen Yoest. Helen Yoest is the author of Gardening With Confidence–50 Ways to Add Style for Personal Creativity. Helen is a sustainable wildlife gardener, and an award winning garden writer in Raleigh. Catch up with Helen via her blog at www.GardeningWithConfidence.com.